The Settlers is the second book in a long series on the founding of Australia. This book continues the story of Jenny Taggert, now free from her convict status, but she (and others) bear the stigma of it and are shunned by the free settlers now arriving. The new colony struggles with the land, as well as the growing power and corruption of the military, who cares for little except making a quick buck. I did enjoy this for the most part, especially when it focused on Jenny and her relationships with the two men she met in the first book, but the storyline sprawled a bit too much at times. I'm not terribly fond of reading about ships and battles at sea, and found myself skimming a bit whenever the story switched to that of Jenny's lost lover(s). I did appreciate learning about the corruption in the new government and the military, at times I thought that went on too long as well. There were just too many of them and too many names to keep track of. It looks like book three moves on to the next generation and Jenny's children, and I do plan to continue reading this series. Needing a break from my fascination with the medieval period, I picked up the first three books of William Stuart Long's Australian series not knowing what to expect and was "hooked" almost from the first page.The characters who people his work are well drawn, endurable and rowdy enough to settle untamed territories. Historical figures are clearly defined, interesting and aptly researched which is always a welcomed addition to any book dealing with historical fiction. Plus, An extra bonus is that the books contain maps of Australia as the first settlers saw it which I find immeasurably helpful in understanding a nation's history. The only drawback is that I'm spending too much time on the internet immersed in the settling of Australia and too many daily chores have gone begging. At least my family hasn't yet tired of me forgetting that a meal should have been on the table a couple of hours ago, there's laundry piling up and the pups really do need a romp in the backyard every two hours or so...otherwise, I'm blessed! This book was just so informative, and I just loved reading about the Australian history, mingled with the wonderful characters, who were so strong, and amazingly resilient. William Stuart Long captured the beginnings of the birth of a great island nation, with compassion, thoughfulness, and such a compelling strength of will. I love this second book, which continues the story of the convicts, soldiers, and free settlers, who left England’s shores, to make their home in a harsh, unforgiving wilderness. Second book of the Australian series. Almost as good as the first novel. While it continued on with Jenny Taggart it also seemed to be governor verses John MacArthur. While I found it as interesting as the first book I found it just a bit depressing at times with the unfairness of that era. I wish I had the next book to the series but unfortunately it is no longer being published. I would recommend reading this as part of the series, very enlightening. I’m fully into this series and am most likely going to read it straight through. This book is not available on on ebook form, so I’m reading older paperbacks. But it’s been a nice change to read an actual book again. This second volume in William Stuart Long's epic history of "The Australians" is another masterful presentation of history in the form of a novel. Our protagonist, wrongfully exiled Englishwoman Jennie Taggart, yearns for a lost love, finds a new one, and faces the challenges of survival near Sydney in the colony of exiled criminals that is to become Australia. Jennie works diligently at her tiny plot of land and at keeping a clean record as an outstanding citizen so she can win her freedom. She is not the only one with a fight on her hands. Local government is corrupt as is the military force controlling the prisoners and the colony. The land and weather are harsh, and officialdom 18,000 miles away in England has turned its back on a place it views as a societal blight. But there are hints of potential in this bleak land including the possibility of gold, rich agricultural valleys beyond the mountains, and personal growth for the stalwart. This series is making me admire the nation and the people of Australia even more. I'm looking forward to the next several volumes in this captivating series. Second in the series and no let up in the quality. I love Jenny Taggart. I laughed with her, I rejoiced with her and cried with her. What a woman. The cast of supporting characters are terrific and the a historical authenticity of the narrative within which the fictional characters interact is fascinating. John Macarthur is loathesome as are his bunch of cronies who are supposed to be responsible for the maintenance of good order in the colony. Governor Bligh is an enigma whom I am hoping to unravel further in volume 3 of the series(The Traitors) which I started at the immediate conclusion of The Settlers. Excellent stuff Mr Long. 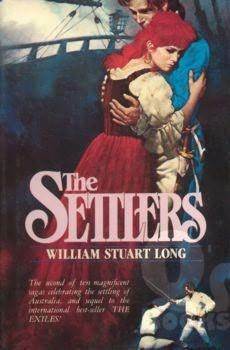 The novel I have read The Setters follows the book the exiles and the leading female is Jenny Taggett as is written here about a book with the same title ,The Settlers, by William Stuart Long. This book, the story is the same I have read , however it was written by Vivian Stuart I am confused as to who realy has written this historical novel? I can see why my Mom loved this series. It is hard to put down! This book continues the life of Jenny Taggert, transported to Australia for a crime she didn't commit in the late 1700s. If you love history, you'll love this book. I've been reading as many of the series as I can get my hands on. I'm going to post all the others so far. William Stuart Long - Violet Vivian Finlay was born on 2 January 1914 in Berkshire, England, UK, the daughter of Alice Kathleen (née Norton) and Sir Campbell Kirkman Finlay. Her father was the owner and director of Burmah Oil Company Ltd whose Scottish family also owned James Finlay and Company Ltd. The majority of her childhood and youth was spent in Rangoon, Burma (now also known as Myanmar), where her father worked. During her life, she frequently journeyed between India, Singapore, Java and Sumatra.Although Vivian is well-known by the surname of Stuart, she married four times during her lifetime, and had five children: Gillian Rushton (née Porch), Kim Santow, Jennifer Gooch (née Stuart), and twins Vary and Valerie Stuart.Following the dissolution of her first marriage, she studied for a time Law in London in the mid 1930s, before decided studied Medicine at the University of London. Later she spent time in Hungary in the capacity of private tutor in English, while she obtained a pathologist qualification at the University of Budapest in 1938. In 1939, she emigrated to Australia with her second husband, a Hungarian Doctor Geza Santow with whom she worked. In 1942, she obtained a diploma in industrial chemistry and laboratory technique at Technical Institute of Newcastle. Having earned an ambulance driver's certificate, she joined the Australian Forces at the Women's Auxiliary Service during World War II. She was attached to the IVth Army, and raised to the rank of sergeant, she was posted to British XIV Army in Rangoon, Burma in October 1945, and was then transferred to Sumatra in December. After the WWII, she returned to England. On 24 October 1958, she married her fourth and last husband, Cyril William Mann, a bank manager.She was a prolific writer from 1953 to 1986 under diferent pseudonyms: Vivian Stuart, Alex Stuart, Barbara Allen, Fiona Finlay, V. A. Stuart, William Stuart Long and Robyn Stuart. Many of her novels were protagonized by doctors or nurses, and set in Asia, Australia or other places she had visited. Her romance novel, Gay Cavalier published in 1955 as Alex Stuart got her into trouble with her Mills & Boon editors when she featured a secondary story line featuring a Catholic male and Protestant female who chose to marry. This so-called "mixed marriage" touched nerves in the United Kingdom.In 1960, she was a founder of the Romantic Novelists' Association, along with Denise Robins, Barbara Cartland, and others; she was elected the first Chairman (1961-1963). In 1970, she became the first woman to chair Swanwick Writers' Summer School.Violet Vivian Finlay Porch Santow Stuart Mann passed away on August 1986 in Yorkshire, at age 72. She continued writing until her death.